Fig 1 Conceptual model of patient centred diagnosis. Clinical context includes the presenting patient concern, the clinician’s role, and the clinical setting. Considering this and the patient’s (or family’s) overall goals of care, a dialogue between clinician and patient or family should be used to agree on a patient centred diagnostic plan. Despite the well recognised burden of diagnostic error and rising use and cost of diagnostic tests,141516 interventions to encourage shared decision making have largely focused on screening and treatment decisions. Meanwhile, the importance of shared decision making in diagnostic decisions has been relatively neglected. Although the processes of diagnosis and treatment are not completely decoupled, shared decision making for diagnosis has distinct considerations (table 2⇓). A key difference is the nature of the patient’s concerns; treatment decisions assume an existing condition, whereas diagnostic situations require clarification of the condition; for example, “my child fell and hit his head, does he need a brain scan?” This difference is critical, because uncertainty is often much greater for diagnosis than treatment, making it much more challenging to explain the options and weigh the risks and benefits to the patient. Managing the wide array of diagnostic possibilities for an undifferentiated symptom is also complicated by a patient’s tolerance of uncertainty, how they as individuals manage trade-offs between false negative and false positive results, and how they act on test results. Precisely quantified benefits and harms are less likely to be available for diagnosis than treatment,18 especially with respect to incidental or false positive results. This is sometimes referred to as the “cascade effect,”), in which initial, smaller scale decisions give rise to a chain of diagnostic procedures that might be unwarranted in hindsight.24 Additionally, a patient’s values and preferences might be unstable, undefined, evolving, or difficult to express verbally or explicitly: patients may just have a “gut feeling” about a decision that is hard to articulate.25 As a result, decision making for diagnosis is often more iterative than for treatment, and may need to happen over an extended period of time. The nature, detail, and depth of the shared decision making process depends on the unique characteristics of the patient and the clinical context; uncertainty intolerable to a doctor might be tolerable to a patient, and a high stakes decision for one patient might be a moderate or low stakes decision for another. Diagnostic uncertainty includes incomplete information (such as early manifestations or common, undifferentiated symptoms), limited evidence (including unknown diagnostic test sensitivity and specificity), or unclear impact of patient preferences on appropriate choice of diagnostic strategies for achieving the patients’ health goals. Stakes refer to the potential impact of benefits or harms of diagnostic workups on outcomes that matter to patients. Uncertainty and stakes should be viewed through meaningful conversation with the patient. How they should guide the intensity of conversations (fig 2⇓; appendix) is explored below in a series of case studies. Fig 2 Framework for adjusting the intensity of shared decision making in patient centred diagnosis based on uncertainty and stakes. When the potential benefit to patients is uncertain, and when diagnostic decisions have high stakes, clinicians should engage in robust, detailed shared decision making with patients. SDM=shared decision making. For routine diagnostic cases or, more broadly, when uncertainty and risks of testing are both low, clinicians should focus on conveying in a straightforward manner the value of the diagnostic procedure (box 1). A 75 year old man who lives independently and whose only medical problem is mild osteoarthritis is seen in primary care with bitemporal headaches and jaw claudication. The clinician suspects giant cell arteritis and plans to order an erythrocyte sedimentation rate test. She explains her diagnostic suspicion to the patient in plain language and her rationale for ordering the test. She offers the patient the opportunity to provide further input or ask any questions he or his family might have. Extensive shared decision making has no substantial role here, for several reasons. Firstly, the patient’s symptoms are highly indicative of a dangerous disorder that can cause major harm (blindness). Secondly, the disease is treatable, and there is general consensus that the benefits of treatment outweigh the harms. Thirdly, the test (venepuncture) contributes to the diagnosis, is low cost, and is nearly free of risk. Lastly, not ordering the test is considered medically negligent. The contextual features of this encounter make it highly improbable that any patient’s values and preferences (however extreme) would over-ride the strong rationale for ordering the test. Effective communication between patient and physician is still important, but the shared decision making conversation need not be conducted in great depth or detail. Clinicians should seek to obtain the patient’s consent to proceed with testing but need not generally engage in deeper, more detailed shared decision making dialogue unless the patient hesitates, hedges, or declines (box 2). A 53 year old man presents with a one week history of low back pain after lifting heavy furniture. After taking a history and physically examining the patient, the clinician finds no abnormal neurological signs. She recommends that the patient apply heat, sleep comfortably, and take over the counter analgesics as needed. The patient expresses worry and is uncomfortable that no further tests are performed. He requests magnetic resonance imaging (MRI) of the back “just to be sure that nothing is wrong.” Using best available evidence, the clinician uses patient centred care techniques (table 1⇑) to discourage testing, explaining that the image is more likely to give false positive findings than to identify an important medical problem. The patient is visibly distressed and anxious and stops talking. The clinician invites the patient to express his concerns and fears; he discloses that his sibling was recently diagnosed as having renal cancer, which first manifested with lower back pain. The general medical consensus is that, in the absence of neurological abnormalities, computed tomography and MRI are unnecessary for lower back pain and potentially harmful, given the small risks inherent with imaging plus the potential harms of downstream treatment for incidental findings. The patient expressed a strong and repeated desire for further diagnostic testing, which might be based on values, knowledge, or past experiences that the clinician has not fully explored. The clinician should use shared decision making techniques (table 1⇑) to ensure that she is fully aware of what the patient understands about the nature of his pain, about the benefits and risks of imaging, and the patient’s underlying fears. This does not imply that diagnostic testing should be pursued—the end result of shared decision making must be to avoid imaging that is not medically indicated. The aim is to further the conversation and make a decision based on a deeper exploration of the patient’s concerns. Although the clinician should discourage imaging procedures that are not based on evidence, the decision should reflect the specific preferences and needs of this unique patient.26 Learning about the recent diagnosis of renal cancer in a sibling might lead to an entirely different, jointly developed diagnostic plan, such as urinalysis and imaging of the kidneys if the urinalysis shows evidence of microscopic haematuria. 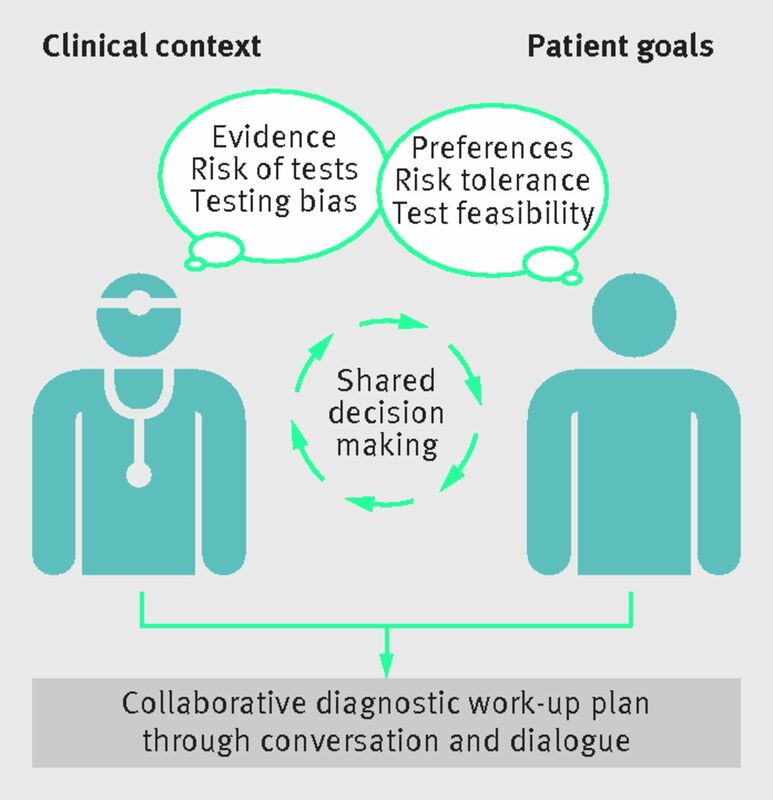 If patient preferences for a particular test are known to be highly variable—such as genetic testing for untreatable diseases or procedures that might have high out-of-pocket costs for a patient—more extensive dialogue is appropriate, regardless of the certainty of benefits and harms of a work-up (box 3). At a routine visit, a 25 year old woman tells her GP that her father was recently diagnosed as having Huntington’s disease after showing neurological symptoms. She says that she is hesitant to get screened for the disease because she is scared of what will happen to her life if she finds out that she carries the gene defects. Screening for genetic diseases such as Huntington’s disease is controversial and complicated. Patients might choose to avoid learning their genetic status because of how the knowledge might affect their daily life; they might fear social stigma or experience personal frustration with an untreatable, inevitable health condition. The patient may be concerned that their knowledge of a future onset of a devastating disease might affect their employment or insurance. Evidence links the diagnosis with an increased risk of suicide. Some patients may decide not to have children. The clinician should recognise that these complex concerns, values and preferences may change, perhaps under different life circumstances, and should therefore be ready to modify the diagnostic plan accordingly. When knowledge of the benefits or harms of diagnostic evaluation is highly uncertain or moderately certain evidence favours neither choice, —a deeper, more detailed, and iterative shared decision making process becomes essential (box 4). A 27 year old woman presents to the emergency department with an intense, throbbing headache for the past 24 hours. She does not remember exactly how it started but notes that it built to maximum intensity within minutes. She has had headaches seven or eight times in the past year and has been diagnosed with migraines. These previous episodes have lasted up to 12 hours, and she is usually able to manage the symptoms with over the counter ibuprofen and resting in a quiet, dark room until the pain subsides. This time, however, the pain was more rapid in onset and more intense than any headache she can remember. The pain is not relieved by drug treatment. She has vomited twice since the episode began, which has never happened before. She has had no recent trauma that she can recall. A careful physical examination shows no focal neurological abnormalities. She is taken for immediate computed tomography (CT), which shows no evidence of subarachnoid haemorrhage or other intracranial pathology. She is observed in a quiet, unlit room and given intravenous fluids, a dopamine receptor antagonist, and a non-steroidal anti-inflammatory drug. The patient reports feeling better in several hours and meets with the attending physician to discuss the appropriate next steps. At this encounter, the doctor seeks to build rapport with the patient. The patient notes that her migraines have forced her to consult regularly with neurologists and says that she is tired of repeated diagnostic tests that don’t relieve her pain. The doctor acknowledges her frustration and explains that the gold standard diagnostic approach for an intense sudden onset headache with negative CT results is a lumbar puncture. He also says that, although the diagnostic value of lumbar puncture after negative CT is debated in this clinical context, his personal tendency with previous patients has been to pursue further testing. Given the high stakes of the diagnostic situation, and high uncertainty, the patient and doctor develop and agree on a diagnostic plan. They discuss the data on how accurately clinical features and CT scans detect subarachnoid haemorrhage and consider several diagnostic options, including lumbar puncture, other imaging (such as CT angiography or MRI with angiography), and watchful waiting. After thoroughly discussing the potential benefit and consequences of each approach, the patient and doctor agree to pursue watchful waiting to reduce the burden of additional diagnostic testing on the patient. She is then discharged after migraine management counselling. The patient presents three months later for follow-up with her GP. She reports that she has continued to have migraine episodes, at greater frequency than before the recent acute event, though none had the intensity that brought her to the emergency department—these are reasonably well controlled with medication. She tells the GP that she read online that recurrent headaches might be symptomatic of brain tumours and asks if she should be concerned. She denies any weight loss, constitutional symptoms, vision changes, seizures, or other neurological symptoms. The GP agrees that a CT scan might have missed a small intracranial tumour that could potentially be detected by other means, such as MRI. He also explains the possibility for MRI to pick up incidental findings that could lead to unnecessary treatment. He recommends forgoing MRI for now with a plan to revisit if the patient presents with new neurological symptoms. The patient is fine with this plan and thanks the physician for answering her question. They agree to follow-up every three months or if any new symptoms arise. Even though migraines are the most likely diagnosis in this case, brain aneurysms and brain tumours are most common among dangerous mimics. Worsening or ongoing headaches may bring rare, dangerous disorders into consideration, such as dural arteriovenous malformation (requiring catheter angiography for diagnosis) or isolated central nervous system vasculitis (for which no test or combination of diagnostic tests, including neuroimaging, lumbar puncture, conventional angiography, and brain biopsy, is definitive). Problems like this are difficult to formulate, even for the clinician, and are even more challenging to discuss with the patient. Even if the diagnostic quandary is artificially constrained to reflect only the differential diagnosis of migraine versus aneurysm, there may be patient specific diagnostic parameters for which no evidence exists. What is the likelihood of aneurysmal subarachnoid haemorrhage in a patient with previous migraine, new thunderclap type, worst ever headache, first ever vomiting, with negative CT at 24 hours, no lumbar puncture result, responsive to treatment, but then increased frequency (but not severity) of headaches without new neurological symptoms? Patients with previous migraine were excluded from critical studies establishing clinical prediction rules for aneurysms in patients with acute headache. Each patient’s story has nuances that might be pertinent (eg, greater frequency but not severity afterwards) but cannot readily be translated into firm, probabilistic estimates. With multiple possible diagnoses and next steps, the overall decision tree becomes complex and uncertain. After deciding to pursue tests rather than watchful waiting, the doctor and patient must decide the sequence of tests and any stopping rules; for example, whether to do MRI plus magnetic resonance angiography first and stop if the results are negative; go straight to catheter angiography, which has the highest likelihood of ruling out all of the relevant dangerous disorders but has non-trivial risks; or do a lumbar puncture, which is less risky and might distinguish xanthochromia from chronic bleeding or raised protein from low grade inflammation associated with vasculitis but is insensitive and not definitive for any of the diagnoses in question. The situation is further complicated by the differing psychology of decision making between doctor and patient. Clinicians might advocate a risk averse approach to minimise harm through diagnostic error, whereas patients might want to avoid burdens or risks of diagnostic procedures that provide no immediate relief of symptoms. These considerations are uniquely swayed by the values and goals of the patient and must be discussed openly for shared decision making to be effective. After making a diagnostic plan, the physician and patient must decide together when to transition away from further diagnostic tests and towards treatment. This process might require explicit acknowledgment of acceptable levels of uncertainty. The transition from diagnosis to treatment is not one way, and further considerations (such as new symptoms or the availability of new diagnostic technologies) might warrant further diagnostic tests after treatment has started. The diagnostic process might be iterative and have an uncertain timeline or unclear endpoint. In some scenarios, such as in emergency care, high stakes and high levels of uncertainty are coupled with time pressure. In these scenarios shared decision making faces unique challenges and assumes even greater importance (box 5). An 82 year old woman staying in the hospital after surgery develops new weakness on the right hand side and confusion. A brain CT rules out visible bleeding, and the emergency team want to give the patient alteplase within the three hour window for suspected stroke. The patient’s family agrees that, if the patient is having a stroke, they favour treatment with alteplase, but they are concerned that she might not be having a stroke, but rather experiencing side effects from pain drugs. They ask for further testing (such as MRI) to minimise the possibility that the patient receives a high risk treatment for a wrong or highly uncertain diagnosis. These tests would delay giving alteplase, potentially missing the therapeutic window and losing the option of effective treatment. Decision making in an emergency is fraught with complications. In this example, scientific evidence from treatment trials puts pressure on the healthcare team to give a potentially dangerous treatment as fast as possible; the needs, values, and preferences of the family are sometimes considered secondary or even an impediment to the medical goal.27 Yet, these situations, with high uncertainty and high stakes, can benefit from more intensive shared decision making. Contributors and sources: The authors have experience and research interests in patient-centred care, patient-clinician communication, diagnostic error, and shared decision making. We have explicitly included a patient advocate with experiences related to diagnostic error as one of our co-authors (HH). The initial draft was prepared by ZDB, SK, and DENT. All authors provided substantive intellectual contributions, reviewed subsequent drafts and provided revisions, and collaborated on and approved the final draft. JH and EPH contributed to case study development. ZDB is the guarantor for the manuscript. Competing interests: We have read and understood BMJ policy on declaration of interests and declare that DENT was supported by the Armstrong Institute Center for Diagnostic Excellence at Johns Hopkins University School of Medicine. SK is supported by an NIH Medical Scientist Training Program grant. Dontje K, Corser W, Kreulen G, Teitelman A. A unique set of interactions: the MSU sustained partnership model of nurse practitioner primary care. J Am Acad Nurse Pract2004;359:63-9. doi:10.1111/j.1745-7599.2004.tb00374.x pmid:15055423. Robinson JH, Callister LC, Berry JA, Dearing KA. Patient-centered care and adherence: definitions and applications to improve outcomes. J Am Acad Nurse Pract2008;359:600-7. doi:10.1111/j.1745-7599.2008.00360.x pmid:19120591. Hargraves I, LeBlanc A, Shah ND, Montori VM. Shared Decision Making: The Need For Patient-Clinician Conversation, Not Just Information. Health Aff (Millwood)2016;359:627-9. doi:10.1377/hlthaff.2015.1354 pmid:27044962. Elwyn G, Dehlendorf C, Epstein RM, Marrin K, White J, Frosch DL. Shared decision making and motivational interviewing: achieving patient-centered care across the spectrum of health care problems. Ann Fam Med2014;359:270-5. doi:10.1370/afm.1615 pmid:24821899. Elwyn G, Frosch D, Thomson R, et al. Shared decision making: a model for clinical practice. J Gen Intern Med2012;359:1361-7. doi:10.1007/s11606-012-2077-6 pmid:22618581. Makoul G, Clayman ML. An integrative model of shared decision making in medical encounters. Patient Educ Couns2006;359:301-12. doi:10.1016/j.pec.2005.06.010 pmid:16051459. Cohen MD. Engaging patients in understanding and using evidence to inform shared decision making. Patient Educ Couns2017;359:2-3. doi:10.1016/j.pec.2016.11.013 pmid:27986242. Levinson W, Lesser CS, Epstein RM. Developing physician communication skills for patient-centered care. Health Aff (Millwood)2010;359:1310-8. doi:10.1377/hlthaff.2009.0450 pmid:20606179. King A, Hoppe RB. “Best practice” for patient-centered communication: a narrative review. J Grad Med Educ2013;359:385-93. doi:10.4300/JGME-D-13-00072.1 pmid:24404300. McGlynn EA, McDonald KM, Cassel CK. Measurement is essential for improving diagnosis and reducing diagnostic error: a report from the Institute of Medicine. JAMA2015;359:2501-2. doi:10.1001/jama.2015.13453 pmid:26571126. Redberg R, Katz M, Grady D. Diagnostic tests: another frontier for less is more: or why talking to your patient is a safe and effective method of reassurance. Arch Intern Med2011;359:619. doi:10.1001/archinternmed.2010.465 pmid:21149744. McCaffery KJ, Jansen J, Scherer LD, et al. Walking the tightrope: communicating overdiagnosis in modern healthcare. BMJ2016;359:i348. doi:10.1136/bmj.i348 pmid:26850726. Manski CF. Diagnostic testing and treatment under ambiguity: using decision analysis to inform clinical practice. Proc Natl Acad Sci U S A2013;359:2064-9. doi:10.1073/pnas.1221405110 pmid:23341625. Schünemann HJ, Oxman AD, Brozek J, et al. GRADE Working Group. Grading quality of evidence and strength of recommendations for diagnostic tests and strategies. BMJ2008;359:1106-10. doi:10.1136/bmj.39500.677199.AE pmid:18483053. Welch HG, Black WC. Overdiagnosis in cancer. J Natl Cancer Inst2010;359:605-13. doi:10.1093/jnci/djq099 pmid:20413742. Saber Tehrani AS, Lee H, Mathews SC, et al. 25-Year summary of US malpractice claims for diagnostic errors 1986-2010: an analysis from the National Practitioner Data Bank. BMJ Qual Saf2013;359:672-80. doi:10.1136/bmjqs-2012-001550 pmid:23610443. Feinstein AR. The ‘chagrin factor’ and qualitative decision analysis. Arch Intern Med1985;359:1257-9. doi:10.1001/archinte.1985.00360070137023 pmid:4015276. Polaris JJ, Katz JN. “Appropriate” diagnostic testing: supporting diagnostics with evidence-based medicine and shared decision making. BMC Res Notes2014;359:922. doi:10.1186/1756-0500-7-922 pmid:25515327. The cascade effect in the clinical care of patients. N Engl J Med1986;359:319-20. doi:10.1056/NEJM198607313150511 pmid:3724824. Epstein RM, Street RL Jr. Shared mind: communication, decision making, and autonomy in serious illness. Ann Fam Med2011;359:454-61. doi:10.1370/afm.1301 pmid:21911765. Solomon MZ, Gusmano MK, Maschke KJ. The ethical imperative and moral challenges of engaging patients and the public with evidence. Health Aff (Millwood)2016;359:583-9. doi:10.1377/hlthaff.2015.1392 pmid:27044955. Brach C. They said my dad was having a stroke. I wish I had been able to handle it better. Washington Post 2016.http://www.highbeam.com/doc/1p2-39618408.html?refid=easy_hf. Flynn D, Nesbitt DJ, Ford GA, et al. Development of a computerised decision aid for thrombolysis in acute stroke care. BMC Med Inform Decis Mak2015;359:6. doi:10.1186/s12911-014-0127-1 pmid:25889696. Singh H, Naik AD, Rao R, Petersen LA. Reducing diagnostic errors through effective communication: harnessing the power of information technology. J Gen Intern Med2008;359:489-94. doi:10.1007/s11606-007-0393-z pmid:18373151. Mulley AG, Trimble C, Elwyn G. Stop the silent misdiagnosis: patients’ preferences matter. BMJ2012;359:e6572. doi:10.1136/bmj.e6572 pmid:23137819. Lavallee DC, Chenok KE, Love RM, et al. Incorporating Patient-Reported Outcomes Into Health Care To Engage Patients And Enhance Care. Health Aff (Millwood)2016;359:575-82. doi:10.1377/hlthaff.2015.1362 pmid:27044954. Newman-Toker DE, McDonald KM, Meltzer DO. How much diagnostic safety can we afford, and how should we decide? A health economics perspective. BMJ Qual Saf2013;359(Suppl 2):ii11-20. doi:10.1136/bmjqs-2012-001616 pmid:24048914.